How to levitate a frog? Which way does field point? Which is the north pole? Low v mid v high field? Is field ever turned off? Why I = ½, 1, etc? Proton = nucleus = spin? MR vs MRI vs NMR? How does B1 tip M? 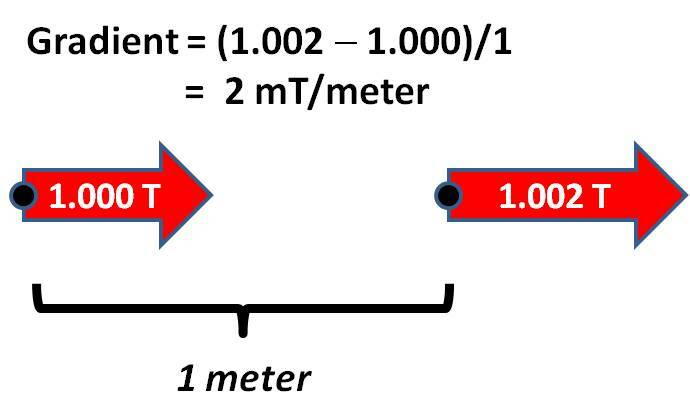 Why is T1 > T2? Bo effect on T1 & T2? How to predict T1 & T2? SE vs Multi-SE vs FSE? Does SE correct for T2? Effect of 180° on Mz? TI to null a tissue? Spoiling - what and how? Phase of blood v Ca++? What are 2D- & 3D-FTs? What does "k" stand for? Why and when to use? Why does Gd shorten T1? Is Gd safe in infants? Why GRE ↑ flow signal? Meaning of CBF, MTT etc? DSC v DCE v ASL? Why does BOLD ↑ signal? Whenever a magnetic field differs in magnitude or direction between two points in space, a magnetic gradient is said to exist. The gradient (G) is defined as change in field (ΔB) divided by change in distance (Δs). Note we have calculated only the magnitude of the gradient. But like the main magnetic field, the gradient (G) is a vector, possessing both magnitude and direction. By convention, the direction of the main magnetic field is designated to be the z-axis. For completeness, therefore, we should say the gradient (G) is a vector of magnitude 2 mT/meter in the z-direction. Alternatively, we could write G = Gz = 2 mT/meter. Since in our example the magnetic field did not change either direction or magnitude in the x- or y-directions, we can also state Gx = 0 and Gy =0. The gradient of B is denoted ∇B, where ∇ is known as the "del" operator. Because B is a vector, ∇B is a Jacobian or 2nd order tensor, a matrix of 9 partial derivatives of the 3 principal components of B (Bx, By, and Bz) with respect to the 3 cardinal directions (x, y, and z). In other words, the gradient of a vector field like B is a rather complex entity, as you must consider how each component of the field may vary in each direction. In the simplified example above we have assumed B to be directed purely along the z-axis (i.e., Bx = 0 and By = 0) and without change in the x- or y-directions (i.e., all partial derivatives with respect to x and y are also zero). So, when we stated that the gradient (G) was 2 mT/meter, what we really meant was that the rate of change of z-component of B in the z-direction (∂Bz/∂z) = 2 mT/meter, and that all other terms in the Jacobian were zero. Fortunately, in MR imaging, we can often assume relatively simplified cases like the one above. For example, the x-, y- and z-gradients used for imaging are generally considered to create variations of B only with respect to the Bz component. Thus as a good first order approximation, we need only consider the partial derivatives in the third column of the Jacobian, assuming all derivatives in the first two columns are zero. Gradients used for imaging can be considered to distort the main field Bo only with respect to the z-direction. The x-gradient, for example, does not "shear" the field horizontally or alter the main direction of Bo, it only makes Bz stronger on one side of the scanner than the other. I'm confused. Isn't a gradient some type of coil?